Did you miss the New Orleans Investment Conference this year? We run through some of the key themes in this overview, from bubbles to what the next hot commodity could be. Held every year for over four decades, the New Orleans Investment Conference is an opportunity for investors to further their knowledge on the trends driving US and global markets. This year’s event ran from November 1 to 4, and featured dozens of speakers and exhibiting companies. Gold featured prominently in discussions, but many other topics came up as well, including other metals and commodities, the economy and more. If you weren’t able to make it to the show, don’t worry. The Investing News Network (INN) has put together a recap of the four-day event, and will be publishing audio interviews with some of the key speakers in the coming days. Scroll down to get a taste of what happened. Bubbles were a central theme at the conference, with the discussion coming to a head during day four’s aptly titled “Booms, Busts and Bubbles” panel. Moderated by Sprott Media’s Albert Lu and featuring Peter Schiff of Euro Pacific Capital, Ben Hunt of Second Foundation Partners and Mike Larson of Weiss Ratings, the talk focused on a number of topical questions. While the panelists didn’t agree on all points, the overall consensus was that the US is facing a bubble in everything — an “uber bubble” as Larson called it. Following on from the dot-com and housing bubbles, this is the third central bank-induced bubble, said Hunt. He and the other panel participants had different opinions about what could pop it. Ben Hunt speaking at #NOIC2018 about what could pop the current “everything bubble” – says it has to be something that undermines confidence in a central bank bailout (could be inflation). Schiff in particular warned that the bursting of this bubble could be “catastrophic,” saying that unlike the previous two bubbles, this one can’t be pushed elsewhere. He explained that he is investing overseas to protect himself. “I want to be far away from this risk,” he commented. Of course, the difficulty in calling for a crash is figuring out when it will happen — as Lu joked at the beginning of the panel, the next financial crisis always seems to be two years away. As the discussion wrapped up, the speakers stayed away from exact predictions, but agreed that a crash could happen soon. Larson said he sees the next serious crisis potentially coming in 2019, while Schiff said, “I think we’re already in a bear market in stocks, [but] I wouldn’t call the correction until it’s officially a bear market.” For his part, Hunt stuck with a prediction of two years. Unsurprisingly, many crash predictions made at the conference were accompanied by recommendations to buy gold. In fact, in the panel discussed above, all three participants commented on the benefits of owning the yellow metal. 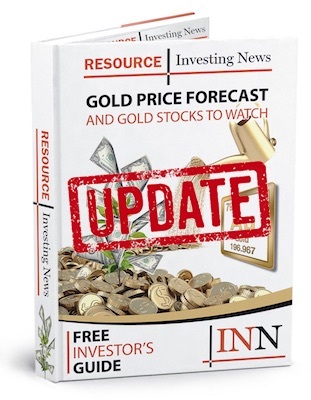 In terms of where the gold price could be going in the near term, forecasts were more subdued. The yellow metal is now down about 3.5 percent year-to-date, and the general consensus seemed to be that investors will need to exercise patience as they wait for it to rise. Watching the #economy panel at #NOIC2018 – Peter Boockvar says he still sees December 2015 as the bottom for #gold, and we are up ~20 percent since then. Stay tuned for interviews with Casey and Lundin. Is it finally uranium’s time? Aside from gold, one other commodity received a fair amount of attention at the conference: uranium. While investors have been hearing for years that its time is coming, the metal’s steady price rise this year has added new meaning to those predictions. In fact, during the “Mining Share Panel,” moderated by Sprott’s Rick Rule, two out of four panelists said uranium is their favorite commodity right now. Those two votes came from Nick Hodge of the Outsider Club and Lobo Tiggre of Independent Speculator, who commented that he’s “extremely bullish” and looking for companies with high margins. Great chat with @mercenarygeo at #NOIC2018 – he says #uranium has stood out as a bullish market in 2018 with a slow and steady rise. Others who marked uranium as a standout commodity included Mercenary Geologist Mickey Fulp and Sean Brodrick of Weiss Ratings, who gave a talk at the show titled “The White Hot Metal That Will Make You a Millionaire.” In his opinion, there are only 37 companies in the uranium space that will be capable of supplying the market as demand grows. “It’s time to saddle up your horses and pick winners,” he said. Stay tuned for interviews with Fulp, Hodge, Rule and Tiggre. Finally, some presenters at the conference took the time to take investors back to the basics, reminding them of important steps to take to ensure profitability. Dennis Gartman’s final piece of advice for investors at #NOIC2018 – “don’t average down.” He says this is what separates the pros from the amateurs. Stay tuned for an interview with Day. Check back for audio interviews with many of the above speakers and more. We will be posting them throughout this week and next, along with additional coverage of the conference.